After receiving criticism from animal welfare charity Viva! and pressure from consumers, British supermarket giant, Iceland have announced they have stopped selling kangaroo meat. 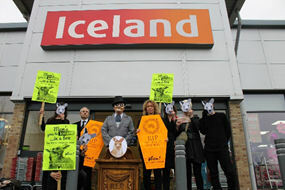 Viva!’s long running consumer campaign included a funeral procession for wildlife inside an Iceland store and a nationwide Day of Action, demanding they stop selling kangaroo meat. Iceland had stocked kangaroo meat, marketing it to consumers as a ‘low fat exotic meat’. However, what they failed to mention is that the kangaroo meat industry is one of the most brutal and violent in the world. It is sold as ‘just a bit of fun’, but don’t be fooled. It is the product of suffering and blood-shed on an enormous scale. Millions are shot every year at night in Australia’s vast outback. Mesmerised by powerful search lights, the animals are supposedly shot in the head but many are mis-shot and die a slow, agonising death. Experts from both the UK and Australia have expressed their concerns about the health implications of consuming kangaroo meat and warned than it ‘could be riddled with pathogens’. Five years ago, independent testing had found dangerously high levels of Salmonella and E.coli in kangaroo meat bought from Australian supermarkets. In 2014, dog ‘treats’ made from kangaroo meat were withdrawn because of Salmonella contamination. In addition to the potential health risks, Viva! warns of serious animal welfare issues surrounding the killing of kangaroos. In the UK it is a common misconception that kangaroos are farmed; when they are in fact completely wild animals. As such, their population can fluctuate massively – and can be especially impacted by factors that can be difficult to predict, such as drought (which is only expected to worsen because of climate change) and disease. 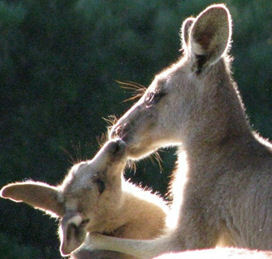 Baby kangaroos (joeys) are pulled from their dying mother’s pouch to be clubbed to death. Still dependent adolescents are shot and dumped or left to die from predation or hunger without the protection of their parents. Popularising and commercialising the meat of wild animals – whose populations are finite and unstable – is deeply irresponsible and potentially disastrous. Whilst populations can build up in some areas they have plummeted in others. In 2015 alone there was 6.8 million kangaroos earmarked for slaughter. According to the Australian Government’s own figures, since 2001 (compared to 2015) there has been an overall drop of 12,577,598 kangaroos in the areas where they are hunted. Animal welfare organisation Viva! have campaigned against the sale of kangaroo meat since the late 1990s. Recently they have also successfully stopped major British supermarkets Sainsbury’s, Morrison’s and Tesco from selling the meat. Only Lidl has failed to listen to Viva! and their customer’s concerns about the meat and as a result is the last major supermarket still selling it. 3. Viva!’s previous campaigns against this industry have achieved wide media coverage including: The Telegraph, The Daily Mail, The Grocer and The Sun.